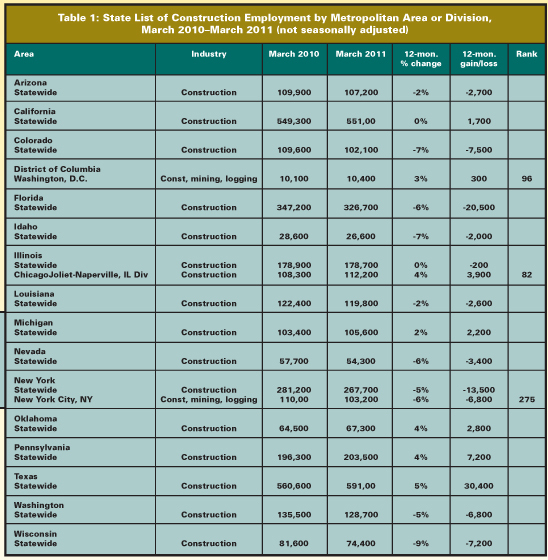 Construction employment increased in 138 out of 337 metropolitan areas between March 2010 and March 2011, decreased in 153, and stayed level in 46, according to an analysis of federal employment data released by the Associated General Contractors of America (AGC). But association officials said that the industry’s 5-year employment slump is far from over and could worsen as public construction winds down. Dallas-Plano-Irving, Texas, again added more construction jobs (9,800 jobs, 10 percent) than any other metro area during the past year, while Bay City, Michigan, added the highest percentage (25 percent, 200 jobs). Other areas adding a large number of jobs included Chicago-Joliet-Naperville, Illinois (3,900 jobs, 4 percent); Warren-Troy-Farmington Hills, Michigan (2,800 jobs, 10 percent); and Northern Virginia (2,600 jobs, 4 percent). Large percentage gains also occurred in Flagstaff, Arizona (24 percent, 400 jobs); Elkhart-Goshen, Indiana (20 percent, 500 jobs); and Houma-Bayou Cane-Thibodaux, Louisiana (18 percent, 900 jobs). The largest job losses were in Atlanta-Sandy Spring-Marietta, Georgia (-6,800 jobs, -7 percent) and New York City (-6,800 jobs, -6 percent), closely followed by Los Angeles-Long Beach-Glendale, California (-6,600 jobs, -6 percent). Lewiston, Idaho (-38 percent, -500 jobs) lost the highest percentage. Other areas experiencing large percentage declines in construction employment included Steubenville-Weirton, Ohio-West Virginia (-26 percent, -500 jobs); Bend, Oregon (-16 percent, -500 jobs); and Lafayette, Louisiana (-15 percent, -1,000 jobs). AGC officials said that private nonresidential and multifamily construction appear to be stabilizing or picking up in most markets, but that the gains are likely to be offset by pending drops in public construction. Noting that prices for many key construction materials continue to rise, AGC officials cautioned that delaying investments in public construction could likely force taxpayers to pay more for the same work in the future. For more information, please visit www.agc.org.